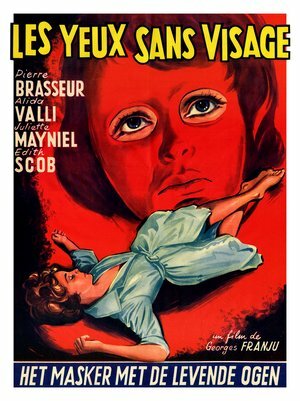 Equal parts pulpy and poetic, EYES WITHOUT A FACE (Les Yeux Sans Visage) is one of a handful of films released in the late fifties and early sixties that helped redefine screen horror for a new era. Following in the footsteps of Peter Cushing's Baron in 1957's CURSE OF FRANKENSTEIN, Dr. Génessier (Pierre Brasseur) is yet another amoral man of science who is more than willing to accept any collateral damage that might result from pursuing his single-minded goal. But where Where Baron Frankenstein sought to create new life from the bodies of the dead, Génessier's particular brand of medical madness is a little more within the realm of possibility. Génessier blames himself for the car crash that resulted in his daughter Christiane (Edith Scob) being horribly disfigured. Now the bad doctor will stop at nothing to repair the damage by perfecting his techniques of face transplantation. To this end he has his assistant Louise (Alida Valli) abduct young women to provide him with the raw material for his procedures. She then disposes of the bodies afterwards, the latest such victim being used to fake Christiane's death. While awaiting the breakthrough she doesn't really believe is coming, Christiane glides through her father's mansion like a ghost, her disfigurement hidden behind a featureless white mask. The closest thing we get to a traditional romantic hero in the film is Christiane's clueless fiance Jaques (François Guérin). He gets hardly any screen time, and even after he figures out what's going on proves almost wholly ineffectual. The police aren't much help, either, putting the audience in the curious position of having only the mad doctor, his murderous assistant, and the film's “monster” (Christiane) to identify with. We cannot count on the forces of love or traditional law and order to save the day here. The screenplay, adapted from a novel by Jean Redon, was written by Pierre Boileau and Thomas Narcejac, the same team who had written the novels that Les Dialboliques and VERTIGO were based on. There is absolutely nothing campy or condescending in their approach to the material, nor in Franju's direction or the performances of his cast. In the end, though, it's not character or plot that matters so much here as atmosphere and striking imagery, some of which would have been quite gruesome for the time. Of course by today's standards the film's scenes of surgical horror are relatively tame, but even if EYES WITHOUT A FACE can no longer shock us, its power to haunt endures. 4 out of 4 stars.